US, 1954, 119 minutes, Colour. Jane Powell, Debbie Reynolds, Edmund Purdom, Louis Calhern, Vic Damone, Linda Christian, Steve Reeves, Ray Collins. A pleasantly inconsequential musical produced by Joe Pasternak, who along with Arthur Freed, produced most of the M.G.M. musicals of the late forties and early fifties. Direction is by Richard Thorpe, a director of all kinds of genres, at this time Robert Taylor's action adventures, Ivanhoe, Knights Of The Round Table, Quentin Durwood. The film is a Jane Powell vehicle and she is quite sprightly. Debbie Reynolds also has verve but is as yet in supporting roles. Edmund Purdom, who had a few years at MGM in such films as The Student Prince, The Prodigal, is stolidly British - a bit like Stewart Granger. Vic Damone is pleasant as the crooner. There is some humour about health fanatics and star-gazers. However, it is a pleasant example of the typical musical. 1. The reputation of MGM for its musicals - stars, songs and choreography, light plots, the glossy colour touch? 2. The popularity of this kind of musical in the fifties? The contrived plot and characters? The insertion of the songs and their performance? Choreography? Reflecting a taste in popular entertainment of the time? How well does it wear? 3. The stars and their particular styles and popularity at the time? The humour of the themes - health, the satire on health fanatics? The point about their narrow views? The pleasant satire on numbers, the stars? Nada, exercise, body-building, foods and poisons? 4. The 14ulvain family ? the shop, the daughters and their Greek names, their home and the dancing exercises, the nourishing meals, the body-building gym, the preparation for the Mr Universe contest? A suitable daffy parody family for this kind of film? 5. The character of Grandpa, his age, agility, his beliefs? His attitude towards his granddaughters and their marriages? His reaction to Adam and his hostility? Ed and his place in the competition? The compering of the competition? His having to give in to Athena? Grandma and her communing, with Nada and the stars? her wandering in and out of the film? 6. 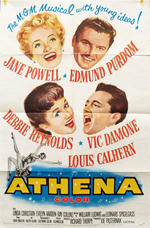 Jane Powell as Athena, a bright and forward heroine? The peach trees, the impulsive attitude toward Adam, the preparations for marriage, charming him? The build-up to the banquet sequence and her being baited, her losing her temper? her reaction at the Mr Universe contest? Reconciliation? her songs? A bright American heroine of the fifties? 7. The contrast with Adam and his New England background, politics, his inability to smile? His relationship with his backers? Family tradition? The formality of his relationship with Beth? The friendship with Johnnie and his helping him? His reaction to the encounter with Athena, trying to find out about her? His fascination, visit? His being converted? running, smiling? Food? His asking Athena to compromise at the banquet and her reaction? His presence at the Mr Universe contest? The fight? his reconciliation with Athena and the happy ending? 8. Debbie Reynolds' verve as Minerva, a pleasant, boisterous character? Johnnie as the popular crooner of the fifties, the girls mobbing him at the T.V. show, business deals and success, friendship with Adam? his going on the health programme? his songs? 9. The background characters, conventions of American films of the fifties: the politicians and their withdrawing support, their rudeness at the banquet? Their plans? Beth and high society? Her breaking off her engagement? The Mr Universe characters? Ed and his training? 10. The insertion of the body-building sequences and the Mr Universe competition? Fifties' 'beefcake'? 11. Why were such musicals popular in the fifties? Their points of view and values? Their attitude towards America, family, relationships, success?